I’m going to be taking you through what a day in the life of a junior doctor is like right now. Before we begin, my days can vary wildly – you might say there is no such thing as a typical day for a junior doctor. In my current job, I rotate between weeks on the trauma ward, on-call shifts and time on the orthogeriatric hip fracture unit. For the purposes of this post though, I’ll talk you through what a normal day is like for me on the trauma ward. I wake early, around 6am and get ready for work. I always make sure to have a good breakfast as I know I won’t be getting to eat until lunch, and can’t be sure when that will be! Once I’m ready I head off to the hospital. We begin the day at 7.45am with a trauma meeting where we go through all the patients who have been admitted over the past twenty-four hours, and those on the list for the trauma theatres that day. Once that’s done, usually by about 8.15am, I head to the trauma ward with whichever other junior doctors are on for that day. One of us prints out copies of “the list” – an electronic list of all the patients on the ward with some background details that becomes the most important possession of the day! We then try to start seeing patients, prioritising anyone who’s particularly unwell. Although these are mostly patients admitted with fractures, many of them have other medical problems that we have to deal with including infections, breathing problems or post-operative complications. Around 9 to 9.30am we get together with the nurse in charge, occupational therapists and physios to do a board round. We run through all the patients on the ward, figuring out what input is needed for them all; mainly so we don’t get unnecessarily delayed in getting them discharged. There’s a high demand for trauma beds so we have to be as efficient as possible in getting patients ready to go from medical, physio and social perspectives. Sometimes it can be a tricky balance deciding where our priorities need to lie that day. There’s enormous pressure to free up beds in the hospital, meaning stable patients ready to go need reviewing early for this decision to be made – yet there are also sick patients who need seeing first too! After board round, we carry on seeing the patients. There can be as many as thirty patients on the ward, although some will be seen by the post-take team who see all those who have been admitted in the past twenty-four hours. Some days there are four doctors to see them all, other days just one or two. As we see each patient, we keep track of all the jobs that we generate, such as checking x-rays and blood results, requesting scans , writing discharge letters or calling other specialties for advice and support. Some jobs need doing straight away, others can wait until everyone’s been seen. On a good day when there are enough doctors and not too many interruptions or sick patients, we can have everyone seen by around 1pm. At other times it takes until the end of the day to have seen every single patient, so we have to be able to prioritise tasks. Stopping for lunch is essential – even if it’s only a short break. We try to get off the ward, meeting up with the other junior doctors on the team who may be working in other areas such as the elective orthopaedic ward or the hip fracture unit. I tend to bring food with me, but if I’ve not been prepared that day I’ll buy something from M&S – and we often buy coffee on the way back to the ward! Most days we’ll have started some of the urgent jobs before lunch, so when we get back we carry on doing whatever needs doing – whether that’s reviewing patients, chasing results or writing their discharge letters. Patients can’t leave hospital until we’ve written their letter and prescribed any medications they need to go home with, so these all need to be done before the pharmacy shuts at 5pm. Speaking to patients’ relatives to update them on the patient’s condition, management and plans for further treatment. Discussing any scans that need doing with the radiology department so they can approve and book them. Checking blood results from that day, looking for infections, anaemia, kidney problems and a whole heap of other things you can tell from them. Talking to other specialties who we might want to come to review our patients, such as respiratory or neurology. Speaking to the microbiologists about antibiotics our patients are on, and reviewing whether these are the most appropriate ones. If all’s going well, at about 4.30pm we try to catch up in the ward office and go through the list of jobs together to make sure we’ve not missed anything. We also update the electronic list at this point so that it’s accurate for the next day. Lots of the time though we’re still busy right up until 5pm or even later. Officially we finish work at 5pm, so hand over anything outstanding to the evening on-call doctor. Sometimes though there are jobs that can’t really be handed over and we carry on working until we’re satisfied it’s appropriate for us to go. Most days I’m out by 5.30pm at the latest, but it’s not unusual to leave a bit later than that. Jennifer is a FY1 doctor who studied Medicine at the University of Bristol. 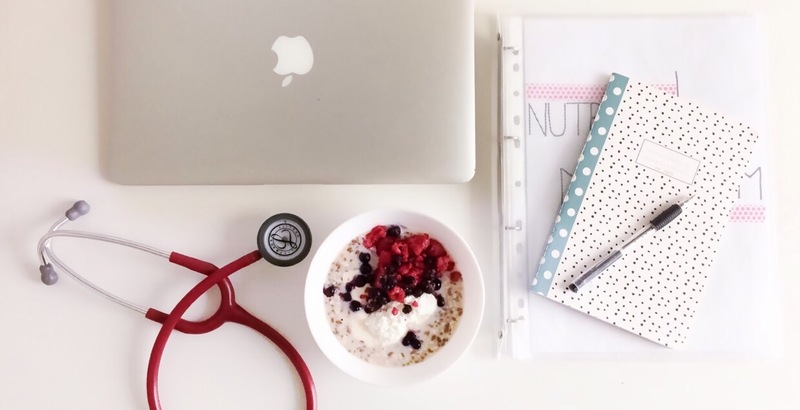 She is currently working in a busy NHS Trauma & Orthopaedic department as well as running a blog in which she promotes healthy living, wellbeing and enjoying all that life has to offer! Next articleGuest BlogsFIRST YEARS AT MEDICAL SCHOOL VS SIXTH FORM: HOW BIG IS THE DIFFERENCE?